If I told you that it was possible for a watch to work without a battery, you’d probably think I was trying to see how easily you’d believe me. If you’re nodding in agreement, don’t worry, I’m not about to tell you that “gullible” is written on the ceiling. Instead, what I will tell you is that it actually is possible for a watch to work without the help of batteries. Please allow me to introduce to you the Tag Heuer Aquaracer CAF2112.BA0809, the watch that isn’t powered by lithium or alkaline, but by the movement of your wrist. Now that you’ve picked your jaw back up off of the floor, make sure it’s put back into place tightly, because this watch has some other nifty features that might just put your chin-bone in jeopardy. As this is a watch that is geared specifically towards scuba divers, some of these features aren’t always practical for average, every-day use, but that by no means makes them any less cool. The unidirectional rotating outer bezel comes equipped with a dive time scale to ensure your safety by accurately keeping track of your time spent under water. And with its glow-in-the-dark hands and hour markers, you’ll always be able to tell what time it is no matter how dark your surroundings may be. Additionally, the bracelet comes with an extension system to make it possible to comfortably wear this timepiece outside of a wetsuit, while the double safety clasp prevents it from falling off your wrist and into the depths. Even though it is a newer model, the CAP2112.BA0833 is very similar to the CAF2112.BA0809 in both price and features. While the CAF2112.BA0809 has a lot going for it, there are some things about this sporty Men’s watch that might lessen its appeal. First on the list is the same feature that makes it the most interesting—the reliance on wrist movement for power. Because this watch has to be in constant motion in order to run, it will stop working if you decide that you want to take it off or wear a different one for a few days. Readability may also be an issue for some people. Even though each hour is clearly indicated with a white marker, the lack of any numbers on the dial makes reading the time a little more difficult than some might prefer. Like many other timepieces of its caliber this is also a heavier piece. So if this is your first luxury watch, it might take some time to get used to the extra weight. Just so you know, this specific model of the Aquaracer collection is discontinued and as such, availability is an issue. 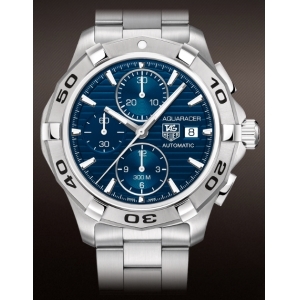 Even though it is currently impossible to buy this watch directly from the Tag Heuer website, there are still some reputable online dealers that claim to have it in stock. However, the most recent version of this watch (the CAP2112.BA0833) is surprisingly similar in price and has many of the same features as the CAF2112.BA0809. All in all, whichever one you wind up choosing, both of these watches are worth the $1,875 to $2,700 you’ll be spending. 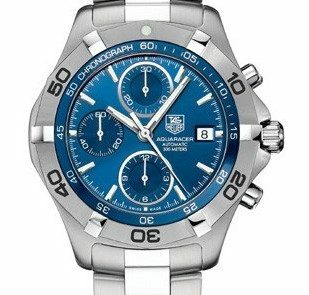 I purchased a TAGHeuer Aaquaracer Automatic Sr nr EBC4531 today a pawn shop. 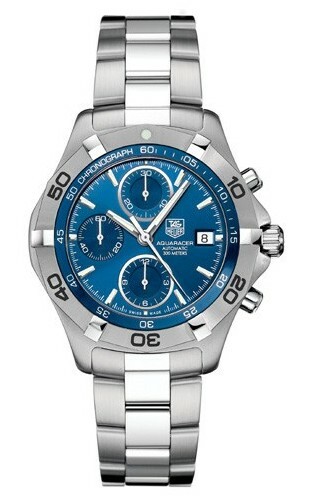 Is it a genuine TAGHeuer or a clever counterfeit?.